The United States Congress designated the Irish Wilderness (map) in 1984 and it now has a total of 16,427 acres. All of this wilderness is located in Missouri and is managed by the Forest Service. Irish Catholic Father John Hogan brought Irish immigrants to this region in the mid-1800s to escape oppression in the big city of Saint Louis, Missouri. His timing was off. The Civil War erupted, and Union and Confederate soldiers raided the settlement. When the war ended, Hogan and his Irish had mysteriously disappeared forever. 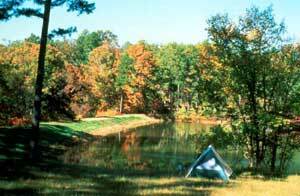 Nothing remains but the name and the rolling-to-steep topography of Missouri's largest Wilderness. Here you'll find sinkholes, disappearing streams that reappear downstream, and Whites Creek Cave, a spacious walk-in with numerous crystalline formations. The western boundary of Irish is near the Eleven Point National Scenic River, which you can see from up high. About 18.6 miles of the Whites Creek Trail provides the main thoroughfare of Irish, a looping path through oak, hickory, shortleaf pine, dogwood, persimmon, and sassafras . . . past Bliss and Fiddler Springs . . . and past Whites Creek Cave. As you hike through these wilds, you may encounter typical Ozark wildlife: deer, squirrel, rabbit, raccoon, fox, bobcat, coyote, turkey, vulture, hawk, and owl. Watch your step lest you disturb a sleeping copperhead, rattlesnake, or eastern cottonmouth. Planning to Visit the Irish Wilderness? How to follow the seven standard Leave No Trace principles differs in different parts of the country (desert vs. Rocky Mountains). Click on any of the principles listed below to learn more about how they apply in the Irish Wilderness.